"Mom, this weekend, can you take me to the roller skating rink?" I smiled at Alex as my heart swelled with pride. It was time. You see, my friends, in my youth I was a great rollerskater. I know. You're probably all of the impression that in my tweenage years, I was closer to Steve Urkel than Denise Huxtable on the Spectrum of Cool. You suspect that not only was I a member of the Math Club, I was also its Treasurer. You presume that I was so nonathletic that I didn't even run to the bathroom. Ah, but friends? On Friday nights, I came alive. Every Friday night from 6th through 8th grade, my mom would drop me off at 6 p.m. at the local roller rink, a state-of-the-art facility near our home. There, resplendent in my Jordache jeans and baseball t-shirt (the one with the glittery iron-on letters spelling "KAREN" on the back), for three hours I would be transformed from Math Nerd to Skater Queen, flying around the rink in my gleaming white skates with the giant orange wheels, wind whipping through my Jheri-curled hair. As Michael Jackson and Kool & The Gang blared over the PA system, I sailed along, performing intricate choreography such as The Rubber Legs and The Crossover (don't bother looking them up, these are specialized terms of art) (okay, I just this minute made them up), while all the other kids would gasp and marvel at my skills. I would smile my brilliant smile as I passed them, my teeth sparkling in the light of the massive disco ball slowly turning above. I was, in other words, magnificent. And the time had come, apparently, to share my gift with my daughter. 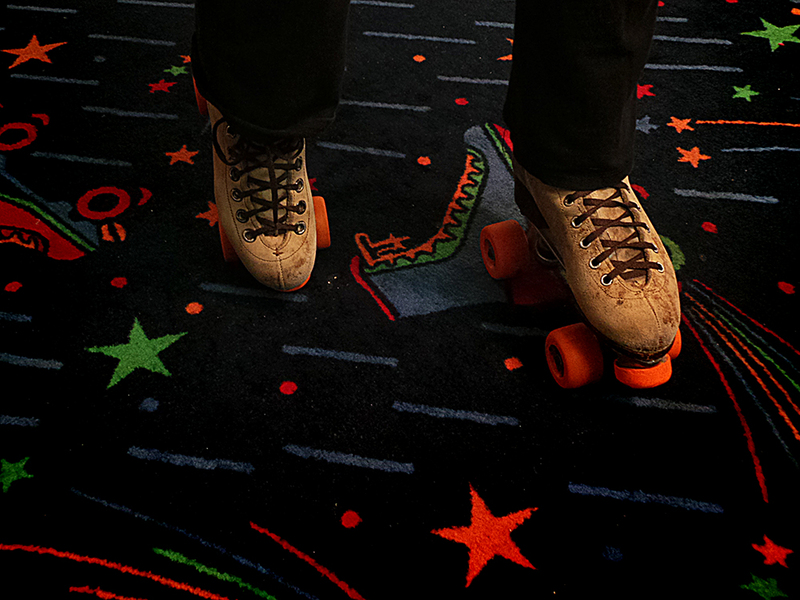 And so this weekend, Marcus and I took Alex to the local roller rink. We drove up on Saturday afternoon to a sad-looking metal building with parking lot comprised primarily of potholes. On entering the building, an exhausted-looking woman sat behind what I could only assume was bulletproof glass. She regarded us coolly. "Um. Yes -- our daughter would like to skate, please?" "Does she have her own skates?" Marcus paid the woman, and she handed him some change and a claim ticket for the skates. As we walked through the door, Alex looked up at me. "Mom? You're not going to skate?" I smiled down at her, gently. "Oh no, my darling, not today," I said. She regarded me sadly, not realizing that my demurral wasn't as a result of fear, but rather of kindness: no little girl likes to be shown up by her mom, after all. My uncanny skating prowess might be intimidating -- I couldn't do that to her. We continued into the old building. Other than a pristine rink and what appeared to be brand-new, garish, skate-themed carpet, the facility wasn't as shiny as the one I remembered from my youth. That said, it did have that familiar piquant aroma, a blend of foot sweat and regret, and this was gratifying. I inhaled deeply. As Alex picked up her skates, I surveyed the room: the ceiling tiles were cracked, the disco ball was much smaller than I remembered (and might have been missing a few mirrored tiles). It didn't matter, though, since none of the spotlights were trained on it, nor was it turning. The scene was like a faded memory of a more glorious time; melancholy, sepia-toned, and I couldn't help a wistful sigh. Alex finally got her skates on, and ventured onto the rink. She was tentative: arms extended at either side, gingerly stomping more than skating. "Just push off gently on one foot and glide!" I called out in my most encouraging voice. "Focus, you can do it!" echoed Marcus. She slowly, painfully, made her way around the rink. Most of the patrons were about 15 years old or younger, in various stages of skillfulness. Some of the older kids were really good, and they would whiz around Alex, startling her as she stomped and flailed. I sat there, watching them, remembering my glory days, wishing I could go out there myself, knowing that it would be better if I didn't. Suddenly, a man flew in front of me, and I ain't gonna lie, brother could skate. He was wearing headphones, bobbing and jamming to his own tunes -- none of this Taylor Swift or PSY nonsense for him, thankyouverymuch -- spinning around the curves, skating forwards and then backwards and then forwards again, having a whale of a time. And his skates -- sweet Mary Margaret, his skates -- had lights on their undercarriages, ones that flashed different colours as he moved. He was undeniably a thing of beauty. He was also about 65 years old. "Give me ten dollars," I suddenly snapped at Marcus. "Wait -- what? You're going out there?" "Dude, I can skate. Besides our daughter needs me. Give me ten dollars." "You're going to need to buy some socks, too," he said reaching for his wallet, and barely smothering his laughter. "I'll give you twenty." I took the money, returned to tired lady's booth and picked up my claim ticket and a pair of brand new socks. I walked over the to skates retrieval area, where two teenagers (stoned, perhaps? just like the guys who managed the skates when I was a kid?) handed me a pair that I had an uneasy suspicion were exactly the same ones their predecessors handed out back in 1979. I trudged back to my seat and started putting them on. Alex clomped over. "Mom! You're coming out?!" Again I smiled, with what I hoped was maternal gentleness. "Yes, it looks like you need some help." "Awesome! I'll wait for you!" I tied the skates on, stood up, and very nearly landed on my backside, before Marcus caught me. "WHOA!" He steadied me with his hand. "Are you okay?" "Of course I am," I said testily. "All skates need a litte warming up, at first. I'll be fine." He helped me over to the rink, Alex watching me warily. "Mom, are you okay?" "I'm fine, Alex." I felt the smile on my face tighten. "Just watch and learn." I glided on my right foot, and miraculously, remained upright. I glided on my left. I totally remember how to do this, I thought to myself, gliding on my right again. It's all muscle memory. It will come back. And before I knew it, I was skating. I mean, I wasn't moving with nearly the fluidity that I did at 12 years old, which, I'm sorry to say, was a bit of a shock. I made it about halfway around the rink before muscles along my shins started seizing (aside: who knew I even had muscles along my shins?). My glide became a bit more of a hobble, and the 60-year-old man with the flashing lights sped past me, catching my eye, and then looking away quickly. Hold up: was this man embarrassed for me? "Mom, are you okay?" called Alex again, clomping along. "I'm fine," I hissed, more determined than ever to recapture my Skater Queen title. Oh, you're going to feel bad for me, old man? I thought to myself. Well, how 'bout I bust out a little Rubber Legs for you? I skated near him, and then willed my legs into my signature move. Oh SOD OFF, screamed my knees in protest, punctuating their sentiment with an obstinate little crackle. I acquiesced accordingly, returning to my hobbleglide as the man skated on, completely oblivious to me or my popping knees. I did about 5 more turns around the rink before returning to sit with Marcus. "You okay?" he asked, his eyes twinkling. "I'm perfect," I responded defiantly. I did do a few more laps after that, and even though I definitely improved, I decided that I didn't want to risk soreness, so I finally gave up, turning in the ancient skates and retrieving my shoes. In the two hours we were there, however, Alex got increasingly better, and before long, she was truly skating. Marcus and I watched her, pleased. At one point the DJ put on The Village People -- YMCA. We heard a cry: a man in roller blades, about my age, sailed onto the rink, gliding beautifully. Once he reached the center of the rink, he stopped, and began doing all of the dance moves to the song, in perfect rhythm. He danced with abandon all by himself, as the rest of the patrons circled without paying any attention to him; nonetheless, he was clearly in his bliss. "Pshhh," I whispered to Marcus, "Bless his heart, he just can't let go of the past, can he? Dude, I would never embarrass myself like that guy." "Oh, I know," Marcus whispered back, nodding solemnly. "Oh, I know." Song: Cars by Gary Numan. I could Crossover to this song like no one else.